On Friday night one of the biggest attractions in women’s boxing, former Gold Medalist and current IBF/WBC Super Middleweight women’s World Champion Claressa Shields will be defending her titles against Tory Nelson. This bout will be the main event of ShoBox: The New Generation airing on Showtime live from the Turning Stone Resort Casino in Verona, New York. Super bantamweight Angel Hernandez and Super Lightweight Shohjahon Ergashev are expected to compete on the undercard. The following is a preview of the Hernandez vs. Garza fight and the main event between Claressa Shields and Tori Nelson. ShoBox has a long history of putting on “crossroad” fights between two young and upcoming prospects. A win for a boxer will usually catapult him to bigger and better opportunities. A loss for a boxer will usually derail any hopes of him obtaining a future world title fight. The fight between Hernandez and Garza is a perfect example of that. Hernandez is twenty seven years old and is two years younger than Garza. He will have about a three and a half inch height advantage and about a two and a half inch reach advantage. Dmitriy Salita is the promoter of Hernandez and he’s been very active the past two years. He fought three times in 2017 and twice in 2016. Garza has also been active, but not as active as Hernandez. He fought three times in 2017 and once in 2016. Hernandez has seven stoppage victories in comparison to the five stoppage victories of Garza. Hernandez debuted in 2009 but had a five year gap in between his second and third professional fight. Hernandez has two big wins on his resume. He defeated Glenn Dezurn and Vladimir Tikhobnov. They were both undefeated at the time. Garza’s only notable win was against Edward Kakembo. His two losses were to undefeated boxers, Jon Fernandez and Neslan Machado. ShoBox fights are usually hard to pick a favorite due to the series’ history of putting on competitive fights between up and coming prospects that have yet to be tested. However, the physical advantages for Hernandez appear to be too great for Garza to overcome. 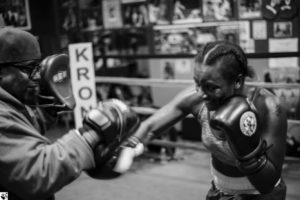 Claressa Shields is one of Women’s Boxing Biggest stars. Her upside is so high that she’s headlining Friday’s ShoBox card and became a world title holder in only her third professional fight. She’s a two time Olympic Gold Medalist and won it in 2012 and 2016. Her opponent, Tori Nelson does not have the amateur pedigree of Shields but women’s amateur boxing did not exist in the Summer Olympics prior to 2012. Shields is still incredibly young at the age of twenty two. Nelson is nearly twice her age and is forty one years old. Shields has only fought four times as a professional but already has 2 TKO/KO wins. Nelson has twenty professional fights but only has 2 wins by stoppage. Shields has the clear advantage in power. Shields was thrown to the fire almost immediately upon turning pro. She defeated Nikki Adler in only her third professional fight and was able to win both the IBF and WBC titles. She has also been active, and has fought three times in 2017 and once in 2016. Even though Shields fought three times in 2017, she feels like she took some “time off” after he last match, in an era where many champions only fight once to twice a year. Nelson only fought once in 2017 and once in 2016. Her biggest victory to date was a TKO over Mia St. John, but Mia St. John was 46 years old at the time of that defeat. Shields appears to be aware of the experience that Nelson possess and has been training hard for this fight. “This training camp I did eight weeks instead of six. A lot of camp has been extremely hard. But I’m so focused and determined on 2018 and starting great and staying busy. I expect my opponent to apply pressure, and to use some dirty tactics. She has more experience, but not that much when you speak of her amateur experience”. Unfortunately for Shields, women’s boxing is not deep with talent, especially at the higher weights where she competes. This should be an easier win for Shields, especially considering the advance age of Nelson and Nelson’s lack of amateur experience. But some big fights await Shields if she’s able to emerge victorious. Christina Hammer is a big name in the 160lb division in Women’s boxing and she may be next on Shields agenda. Chris Cyborg of the UFC has also been talked about as a possible future opponent.